Why the hell am I in Panama? Many people wanted to receive regular news from my Panama adventures, and I therefore promised to maintain a blog along the way. I arrived here on June 3rd, we are now the 16th. Obviously, I was stuck in front of a white page for way too long. But the time to start has come. And to start off a good foot, I will answer one question that you faced me with… too often. Why the hell am I in Panama? Well, I won’t lie by saying that the climate, the sea and the tropical rainforest had no part in my pondering. However, the main reason why I came here is a really cool research project. I study a relatively unknown butterfly called Eumaeus godartii (Boisduval, 1870), also known as the White-Tipped Cycadian. This butterfly feeds off a living fossil, Zamia stevensonii. This plant is part of the cycads, a group of gymnosperm plants with naked seeds that is somewhat related to conifers and ginkgos. Ok, taxonomists are still arguing if this plant is really a distinct species (Z. stevensonii) or an isolated population of Zamia elegantissima, but I will let true botanists tear each other apart on the matter. Our dear Zamia, as many cycads, bears particularly tough leaves, and is protected by a group of toxins that prove dangerous for, well anything with DNA (which happens to include all currently known life forms). When these toxins are cleaved, we obtain methylazoxymethanol (MAM) which can cleave the chemical bonds that hold DNA together, thus causing mutations and tumors in both plants and animals. Only a few animals are able to feed off these cycads by maintaining a chemical bond between a sugar and the MAM, therefore rendering it harmless. Eumaeus godartii is one of those select few. Zamia stevensonii in its natural habitat. 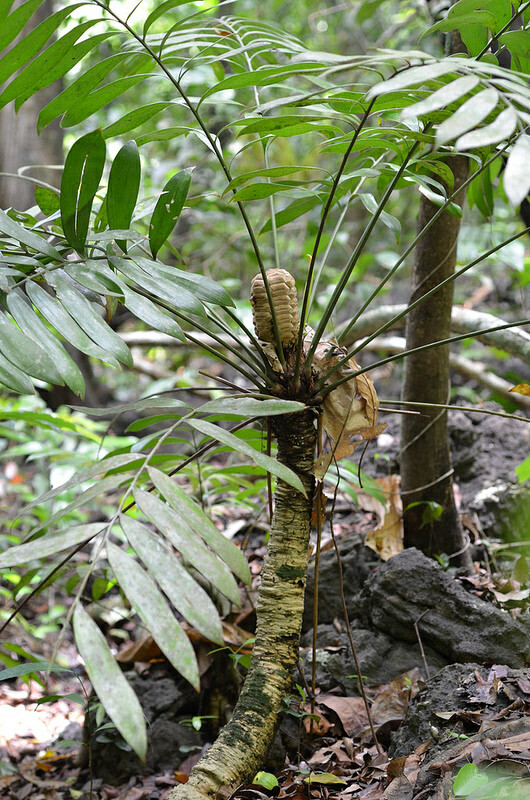 The plant is roughly 60 cm tall and bears a female cone at the apex (Photo: Nicolas Chatel-Launay). This is great, but why bother? I’m actually interested in aposematism. It is a defence strategy that deters predators. An animal can for example sport flashy colors, or produce a strong odour, to tell predators that they should think twice before taking a bite. Often cited as example, the Monarch butterfly enjoys a showy orange coloration to tell predators that it contains cardenolides, which will provoke heavy vomiting if a predator is stupid enough to try eating it. The White-Tipped Cycadian uses the same strategy. The caterpillars, pupae and adults share showy and colourful patterns. As in many animals that use aposematism, the caterpillars often eat on the top side of leaves where they are quite visible. The adults are also very easy to catch, as they fly slowly and lazily. Now, a little security tip for those of you who have never set foot in a tropical forest: if an animal is very colourful, and it seems totally unafraid of you, there is most likely a good reason. DO NOT TOUCH IT! Bringing it back to my caterpillars. Unless you are foolish enough to eat one, there is no danger. As for my research project, there are a few questions swirling in my brain. What is the link between the quantity of toxin in an animal and the intensity of its warning displays? What impact would a change in their food have on their toxicity and on the intensity of their coloration? Will pigmentary colours (formed by chemical pigments) and structural colours (formed by the refraction of light through transparent scales), both being present in Eumaeus godartii, change in the same way following a change in the food or in the toxin concentration? To put it all in one sentence, I am trying to find out if the intensity of visual displays is an honest indicator of an animal’s actual toxicity. Now if we leave theory behind, I first had to find caterpillars. I passed the last two weeks heavily depressed because, after covering whole areas of tropical forest filled with cycads, I could not find a single caterpillar. I will spare you the mosquitoes, the heat, the oppressing humidity (did I mention it’s raining season right now), the shrubs covered with nasty stinging ants, the wasps and the snakes I fear to find under each pile of leaves. 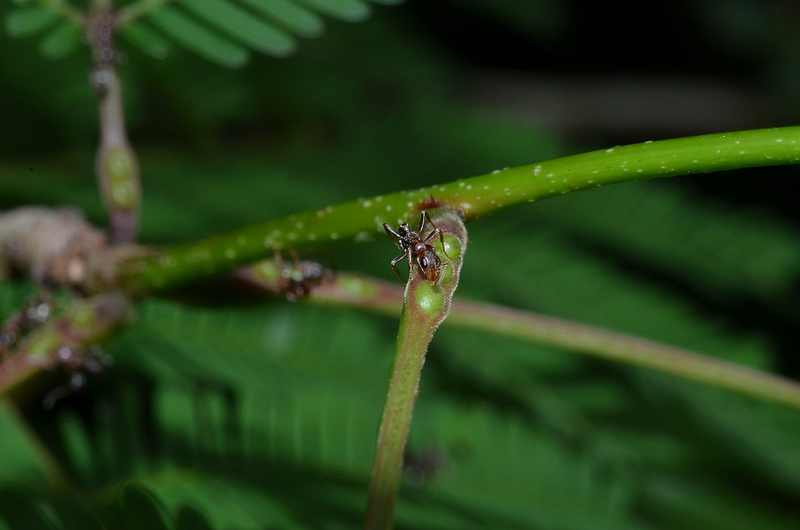 The forest is colonized by acacias that are protected by small armies of ants. They are fed by the shrub, and in exchange, they use their stinger and powerful venom to defend it against any animal that mistakenly brushes the plant. I can tell you that we learn real fast to stay clear after a few very painful stings (Photo: Nicolas Chatel-Launay). Oh yes! Thursday June 5th, I found a dozen eggs… that hatched an eon or two ago, with no sign of a caterpillar to be found. Last Friday (June 13th), I finally found the longed for caterpillars! 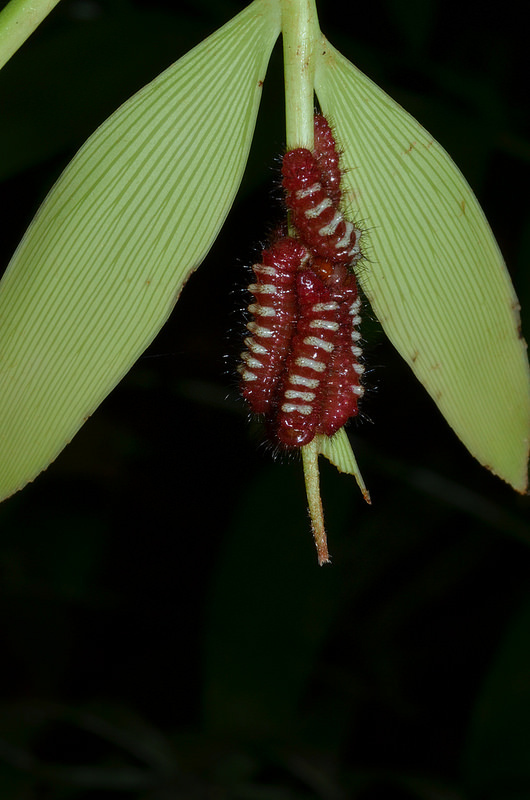 Caterpillars of Eumaeus godartii feeding off a young Z. Stevensonii frond (Photo: Nicolas Chatel-Launay). The next step is to find out if they will agree to survive in a lab. If I am incredibly lucky, they will accept to develop with artificial food. It would be great, because I know the exact composition of this food and I can tweak it with precision. If I am reasonably lucky, the caterpillars will accept artificial food enriched with cycad extract. I will then have to standardize the extract to create diets that can be compared statistically. Now I might be stuck with ungrateful mouths to feed that refuse anything other than their favorite plant. I will then have to feed them off leaves of different quality or age, analyse all leaves chemically, and find a way to include that in a decent statistical test. I hope I never have to think about this. This being said, I hope you enjoyed the reading. I will give you more news soon. Depending on how I feel, it might involve awesome seafood, my newfound love for air conditioning or Panama Ciudad’s nightlife. We’ll see next time. ← Mais qu’est-ce que je fiche au Panama?